The Japanese company will unveil and test its “brain-to-vehicle” technology at next week’s Consumer Electronics Show in Las Vegas. 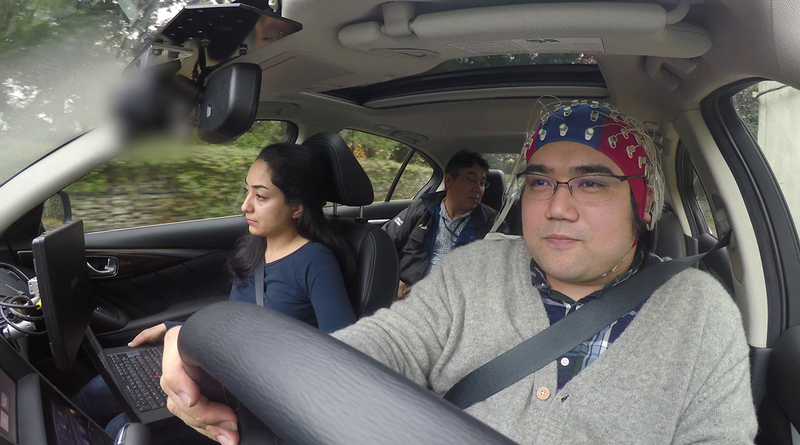 The “B2V” system requires a driver to wear a skullcap that measures brain-wave activity and transmits its readings to steering, acceleration and braking systems that can start responding before the driver initiates the action. The technology measures brain waves and sends those signals to steering, acceleration and braking systems. The driver still turns the wheel or hits the gas pedal, but the car anticipates those movements and begins the actions 0.2 seconds to 0.5 seconds sooner, said Lucian Gheorghe, a senior innovation researcher at Nissan overseeing the project. The earlier response should be imperceptible to drivers, he said. Carmakers are working on ways to keep driving relevant as newcomers such as Alphabet Inc.’s Waymo and Apple Inc. try to upend the industry with fully autonomous technologies. IHS Markit expects 21 million autonomous vehicles to be sold annually by 2035 — equivalent to about a quarter of all current vehicle sales. Many manufacturers, including Toyota Motor Corp. and BMW AG, say they won’t give full control to computers and plan to continue building cars with distinct driving characteristics. Yokohama-based Nissan, maker of the Leaf electric vehicle, plans to introduce fully autonomous cars in 2022. Besides predicting drivers’ movements, the skullcap also could detect their preferences and discomfort when the vehicle is in autonomous mode, prompting systems to adjust accordingly. Yet, drivers of autonomous vehicles still will be able to flip a switch and take manual control of the car. That’s where Nissan’s brain-to-vehicle system comes into play. “You are feeling either that you are a better driver or the car is more sporty and more responsive,” said Gheorghe, who uses the system himself for 15 minutes a day while commuting to work. The technology, which Nissan said is exclusive, will be included in fully autonomous cars and should be ready in five to 10 years, the company said. The prototype resembles a cap that would be worn while gaming or undergoing medical testing, with wires coming out of the top. Brain wave monitors also are being used by BHP Billiton, the world’s biggest mining company, to check if its truck drivers are fatigued. The Australian company uses a six-inch strip fitted inside caps and helmets. Gheorghe’s motivation comes from the enjoyment he experienced at age 18 after his father bought him a Nissan Fairlady Z. “There are many ways you can contribute to society — I chose this one,” said Gheorghe, who’s worked at Nissan for 12 years. He was adamant that the skullcap isn’t reading a driver’s mind. Rather, it’s detecting and then decoding brain activity that can occur about two seconds before a voluntary movement. Nissan will demonstrate the technology at CES using its IMx electric concept car, which Gheorghe said is “brain-connectivity ready.” People from the audience will simulate driving on a highway for a few minutes, and the car should make adjustments in real time. Automakers have flocked to CES in recent years to demonstrate their most advanced technologies in artificial intelligence and smart cars. Last year, Toyota showed a concept that can sense your emotion, and Daimler AG displayed an electric van with a drone on top that automatically fetches and delivers packages. Nissan, which spent about 490 billion yen ($4.4 billion), or 4.2% of its revenue, on research and development in fiscal year 2016, is more aggressive than Toyota and Honda Motor Co. in drawing up timelines for autonomous vehicles. Nissan plans to allow cars to change lanes on highways autonomously this year and to navigate city roads and intersections without human interference by about 2020.